Your kid's got big dreams. Tomorrow: Space Camp. Next year: NASA. By the ripe old age of 22, they figure they'll be walking on the moon. Ambitious. We appreciate that. In the mean time though, make sure they get a lot of practice in. We're talking slow bounce-walks across the backyard. Practice talking with their head inside a bowl or a pan. They must practice staying awake at crazy fast speeds (the slide should do nicely for this). Also, a little bit of engineering practice would be good. We recommend cardboard rockets with personalized paint jobs. And of course: the suit. If they're practicing for space, they'll need to get used to being enclosed in a completely air-tight suit. Well these gloves aren't air-tight, but they sure look official! 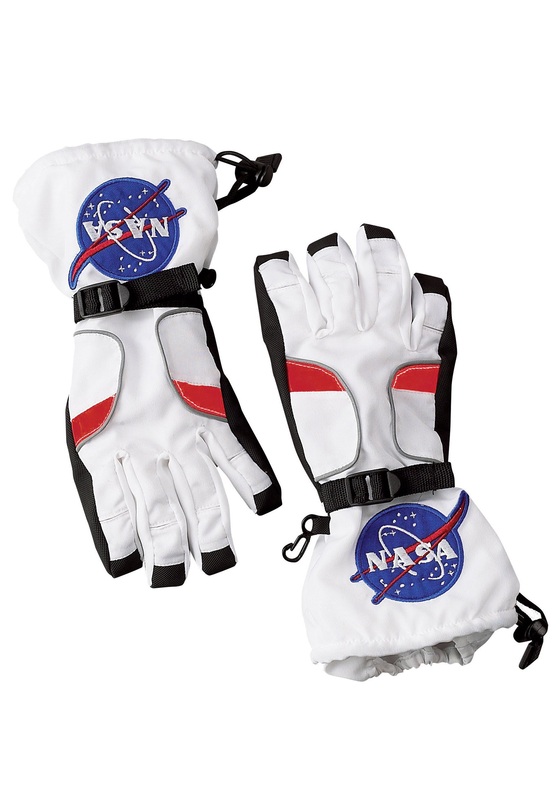 They're made of windbreaker material with a fleece lining, anti-slip surfaces, adjustable elastic wrist bands, and NASA patches. Your kids will look and feel super official in these. Now make them practice planting flags in the back yard with these on, and their training will be complete!